We are looking for an enthusiastic Organist and Director of Music to further develop our musical life. The successful applicant will contribute to the mission of our parish by maintaining and developing our high standards of liturgical worship through excellent musicianship. He or she will play the organ, direct and build up our Benefice Choir, support us as we seek ways of using music to further the mission and growth of the church, and promote the parishes as a place of excellence in music within the local area. The Benefice lies within the Anglo-Catholic tradition of the Church of England, and has a worshipping life in which music plays a vital part. We are part of the family of the Diocese of Oxford and are a parish of The Society under the care of the Bishop of Ebbsfleet. an enhanced criminal record check with the Disclosure and Barring Service (DBS) will be required for the successful applicant. In the villages of Hanslope and Castlethorpe are St James’ Church and SS Simon & Jude, home, between them, to the Benefice Choir. This choir has a strong and growing musical tradition with two Sung Masses every Sunday in each church throughout the year, together with Feasts and Festivals. Rehearsals normally take place in St James Church. The choir was first mentioned in village documentation in February 1894 and in July 1894 the two Castlethorpe and Hanslope Choirs combined and by 1895 the choir had increased in numbers and parts. The Choir today has a traditional structure as a mixed choir (both male and female voices) consisting of Soprano, Alto, Tenor and Bass voices with an occasional role for baritone voices. New members are always welcome. The Director of Music’s post is currently vacant after Alex Allcock-Rouse stepped down in the early Summer. Rehearsals normally take place on Thursday evenings from 6.15 – 7.15 for the full choir. Rehearsals usually take place in Hanslope St James Church but on occasions this moves to Castlethorpe when rehearsals are for services to take place there. New members are always welcome and, whilst the standard is increasing all the time, the emphasis is as much on enjoyment and participation. The choir supports the musical life of the parish and often participates in fund raising events and wider village events too. 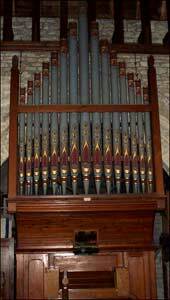 Within St James there is a newly-renovated pipe organ where the console is to the South side of the nave and the pipes in a gallery above the congregation (built around 2000) at the West end. This allows the organ music to fill the whole church and gives a whole new meaning to “uplifting”! The organ, originally from St Andrew’s Old Headington, was installed in 2009 after a mammoth £86,000 fundraising effort. 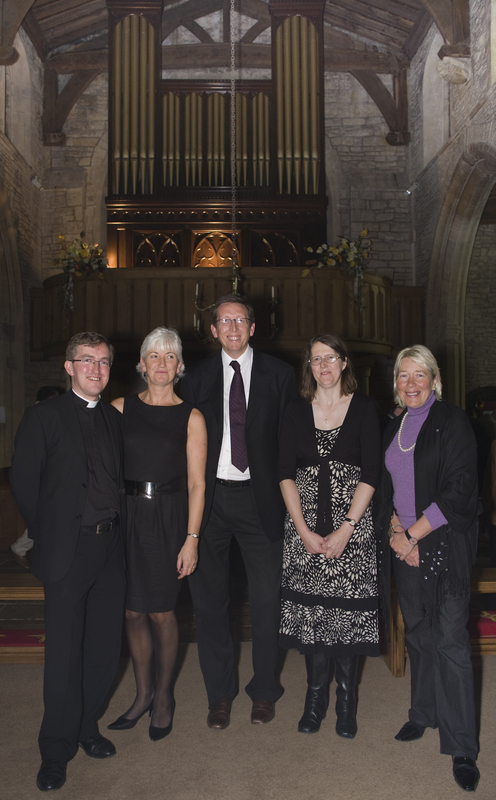 Fr Gary is pictured alongside Sue and Andy Grout, Diane Gordon and Jan Taylor who master-minded the fundraising effort. The original organ was sited in the North wall of the chancel (now replaced by a beautiful oak screen and doors through the archway to the Watts gallery).